You are here: Home / Basketball / Is this Toronto’s year to get the job done? Is this Toronto’s year to get the job done? For the fourth season in a row, the Toronto Raptors are a major player in the Eastern Conference. They’ve quietly crept their way up to capture the number one seed ahead of the Boston Celtics and the Cleveland Cavaliers. With just a few games left in the regular season it looks like the Raptors have secured the first place slot and will head into the playoffs to face either the Milwaukee Bucks or the Washington Wizards in the first round. 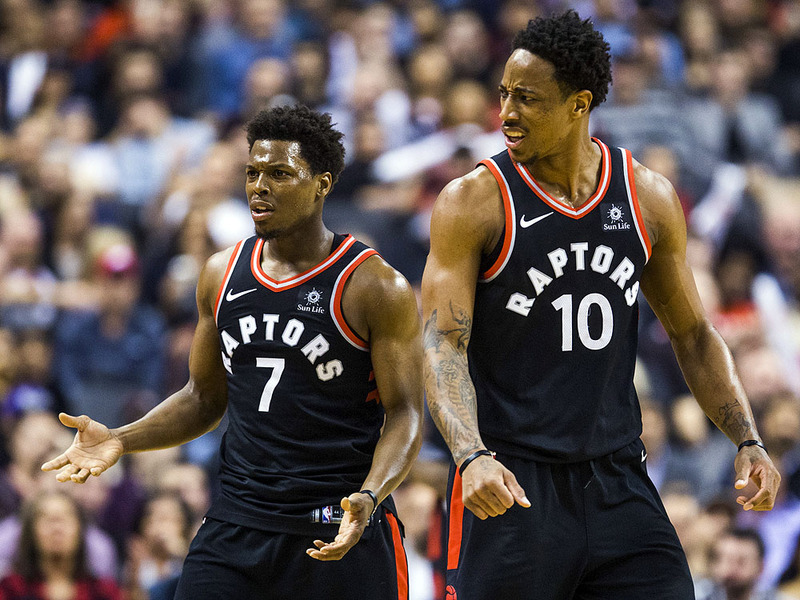 The Raptors as a formidable presence in the East is nothing new. They’re an incredibly talented organization with one of the most enviable frontcourt duos in the league. Averaging a combined 39.6 points per game, Kyle Lowry and DeMar DeRozan rival the scoring prowess of the Golden State Warriors’ Stephen Curry and Klay Thompson, and both Lowry and DeRozan share in the effort to faciliate offense combing for an average of 12 assists per game. In 2016, Toronto made it all the way to the Eastern Conference Finals before losing out to the Cleveland Cavaliers. And in 2017, they were routed once again by Cleveland in a 4-0 sweep that sent them home after only the second round. Multiple years in a row I have written about Toronto possibly being THE team to end the Cavs dynasty in the East, and multiple years in a row they just couldn’t get it done. So, why haven’t they been able to close? If you ask me, it’s primarily a lack of what I like to call “heart” or the “killer instinct”. Talent alone can take you pretty far, even to the Eastern Conference Finals, but without a primal will to win you’ll lose out to those who possess that Mamba Mentality. Michael Jordan had it. Kobe Bryant had it. And, LeBron James is The King because of it. Sure, Toronto’s tough luck can be partially blamed on size given Lowry’s small stature, but it has a lot to do with aggressiveness. Offensively, DeRozan and Lowry pack a mighty punch, but on the defensive end, things get a little tricky. These two simply aren’t known for their defensive prowess, and when faced with a team who will prove tough to guard from the perimeter they get themselves into trouble. In the regular season, players may not be putting forth their most aggressive defense in an effort to remain healthy long into the post-season, however, once the playoffs begin all bets are off. Guards like Curry, Thompson, and even Durant are far superior to Lowry and DeRozan on defense causing a high-scoring team to topple under pressure. However, this season the Raptors have added 8-year NBA veteran Serge Ibaka to their lineup, and that may provide a boost as they enter the post-season. Ibaka’s defense (while questionable at times) poses a serious challenge for opponents given his size and aggressiveness. Combine Ibaka with Jonas Valanciunas, and the Raptors just may make another appearance in the Eastern Conference Finals as the Celtics are now facing the post-season without Kyrie Irving. However, the challenge remains for the Raptors’ frontcourt. If they are able to make it to the Finals, they will either face the Houston Rockets who play a very similar game or the Warriors who are going to be nearly impossible to beat for years to come. If we do see the Rockets and the Raptors in the Finals, it will probably be a pretty fun series. There will be virtually no defense played, but the scoring fireworks show will be on full display. I envision this match-up looking much like an All-Star shootout with dozens of clips ready for the highlight reels. However, the more likely scenario is that the Raptors would face the Warriors in the event they make it to the Finals. I fully expect the Rockets offense to collapse under playoff defensive pressure, and against the Warriors in a series, the Rockets don’t stand a chance. Similarly, the Raptors would likely also fall prey to the Warriors’ tough defense led by the fiery Draymond Green. While I would be interested to see an Ibaka/Green showdown, the Warriors simply have too much firepower from the perimeter for the Raptors to make an effective impact against the Curry, Thompson, Durant scoring regime. Ultimately, I expect to see the Raptors make it to at least the Eastern Conference Finals this season. They just may have a chance against the Cleveland Cavaliers who are maintaining fairly-well with their revamped roster, and the LBJ factor basically guarantees Cleveland at least an Eastern Conference Finals slot, but time will tell if he can get his group in line before things get a lot more serious.